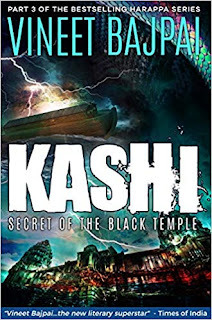 Kashi : Secret Of The Black Temple is the third book in the "Harappa" series by Vineet Bajpai. If you have missed the earlier releases, I would recommend you to read them prior to start reading this. Vineet is undoubtedly a master storyteller and lived up to the tagline conferred to him by the DNA till date. I was simply awestruck with the way he wrote this story leaving no stones unturned. When I finished reading his previous books, I was always left with more excitement which made me to look on for the next release and this excitement got suppressed only with this book since I hope this would be the end of the long journey but you never know, he may come up with one or even two more novels(as a sequel). The novel begins with a short introduction of its prequel(the previous 2 books). I loved the usage of most appropriate pictures in the beginning of each chapter. As you know the story is about the clash between Devtas and Demons. Vidyut was not aware as to how his father Kartikeya Shastri died. He was also not convinced about getting others killed and wasn't aware of the reason of his birth. However when he meets the Mathadeesh Dwarka Shastri, he understands the purpose of his life/birth and also learns about his great lineage who were half human and half GOD. The secret Brotherhood or the Order which was controlled by three powerful men including Frank from Stonefellar family wanted to capture the secret of the Black Temple at any cost since it would very much challenge their very existence. They send Maschera to Kashi where the last of the known Black Temple was believed to be in existence. On the other hand, Satyavrata Manu(dated back to BCE period) faces a near extinction challenge from the ruthless cannibal leader Nara Munda. He loses most of his men including Somdutt who has been regarded by him as equivalent as his father. He then remembers the special conch givn to him by none other than Matsya. Could he overcome the challenge posedd by Nara Munda against Manu's Ark which carried the last hopes of the existence of Mankind during the Great Pralay? On the other hand, during the present era, Vidyut faces the litmus test of taking the mighty Maschera one on one. Where is this Black Temple located? What secret did it guard? Did Vidyut get to know about the secret?